As digital signage is an inherently visual medium, graphics and animations are increasingly used to visualize data from business applications or other feeds. In fulfilling its capability to improve branding or the ambiance and vitality at a location, content as art is emerging, and art through interactivity is providing an engaging and immersive experience. Data Visualization is especially well suited to customer-facing applications such as retail, food services, trade show or promotional exhibits, hospitality and sporting events, education and in corporate communications, where there is dwell time and value in viewer engagement. But it’s not just data from the rapidly growing wellspring of information people are calling the Internet of Things that can be used to create new and novel experiences via digital signage. And the fact that the information is being presented in a novel way can make it stand out even more in a world where on-screen content delivery is becoming more commonplace. In some creative use-cases, Arnold said, information can be delivered to viewers in an ambient way that “envelops” them without their explicit awareness. The human brain, which makes up only 3 percent of body weight but eats up to 20 percent of body energy, is hardwired to conserve energy wherever possible, said Ed King, vice president of strategy at MaxMedia, and that means it usually takes the path of least resistance. “When confronted with words, numbers or icons/graphics, the brain always looks for the ‘quick answer.’ By creatively visualizing data, wayfinding and other digital signage, retailers stand a better chance of communicating their message more efficiently and effectively to customers,” he said. Doug Bannister, CEO and CTO of Omnivex Corp., said his firm views the digital signage experience as extending beyond just the screens themselves and encompassing the surrounding environment. “By using real-time data collected from sensors and feeds along with data-triggered content and devices, the viewer can be immersed in an all-encompassing multi-sensory experience,” he said. 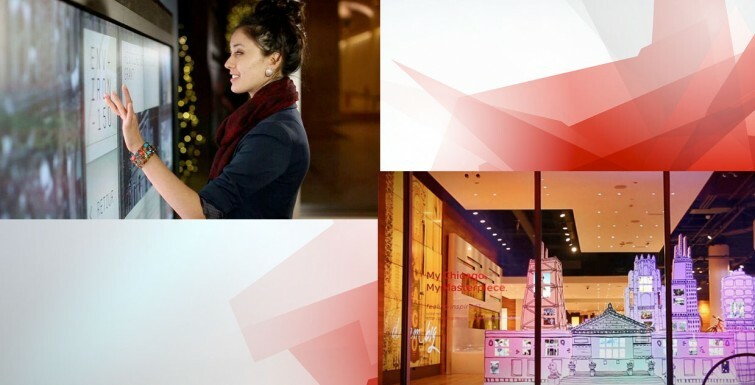 “Displaying pre-prepared, attractive artwork on digital signs is easily accomplished. Installations that incorporate synchronized area lighting, sounds and images that react to elements such as the movement of viewers, sports scores, temperatures, sunlight or wind, and incorporate the motion of physical objects such as products, patrons or fans can make an art installation truly impactful. 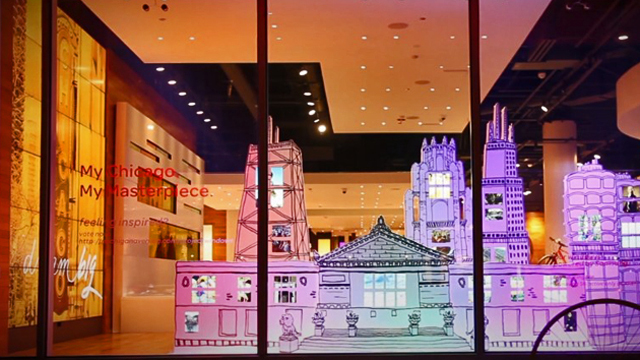 As an example, MaxMedia this year created a window display for AT&T’s flagship store on Michigan Avenue in Chicago as part of a larger competition among all retailers on the city’s famed Magnificent Mile shopping district. The theme for 2015 was in support of the Art Institute of Chicago and featured many masterpieces brought to life on mobile devices. With the help of MaxMedia, AT&T was recognized with two awards including the Most Engaging award and the People’s Choice award. Financial outcomes are not disclosed, but the display was a showstopper and compelled many passersby to enter the store and investigate the Samsung devices featured in the display. In another example, Ontario Lottery and Gaming Corp. is making use of ambient digital signage to create a particular atmosphere and experience for shoppers, according to OLGC Manager of Digital Signage and Game Marketing Michael Tutton. In some of its properties, the lottery makes use of what it calls “ambient” content as part of architectural feature walls, he said. In the entrance to those properties, digital signage screens are situated behind an indoor waterfall in waterproof casings, displaying custom-designed content not aimed at communicating a specific message but rather to simply add color, shape and texture to the waterfall feature.